Home > Food Facts > Fruits > Is Apple Juice Acidic or is it Good for Acid Reflux? Is Apple Juice Acidic or is it Good for Acid Reflux? Apple juice is delicious, refreshing, and contains good amounts of vitamins and minerals. It is rich in vitamin C and provides 159% of the recommended intake. Most of the fruit juices are acidic as they have a low pH. So is apple juice acidic or alkaline? Let us find out. Is Apple Juice Acidic or Basic? The pH level of a liquid or any substance decides if it is acidic or alkaline. The pH of apple juice may depend on the type of apple. It also varies with the ripeness and freshness. What is the pH level of Apple Juice? The pH of apple juice varies from 3.35 to 4. The lesser the pH the more the acidity. Apple juice that has pH three is more acidic compared to that with pH 4.5. The processing method also affects the pH level of the juice. The acidity of the juice affects its taste. A less acidic juice will lack freshness, whereas an extremely acidic juice tastes sharp. Malic acid and ascorbic acid are some of the acids present in apple fruit. The acidic juices can affect the tooth enamel and erode it. According to a study in Journal of the Indian Society of Pedodontics and Preventative Dentistry, apple juice doesn’t erode the tooth enamel as it has good amounts of phosphorus and fluoride. These minerals have a protective effect on the enamel. But still you should take some preventive measures while drinking acidic juices. Is apple juice acidic? Yes we know that now. So, let us see the acids found in apple juice. Both apple juice and orange juice have almost the same acidic levels but they have different acid profiles. 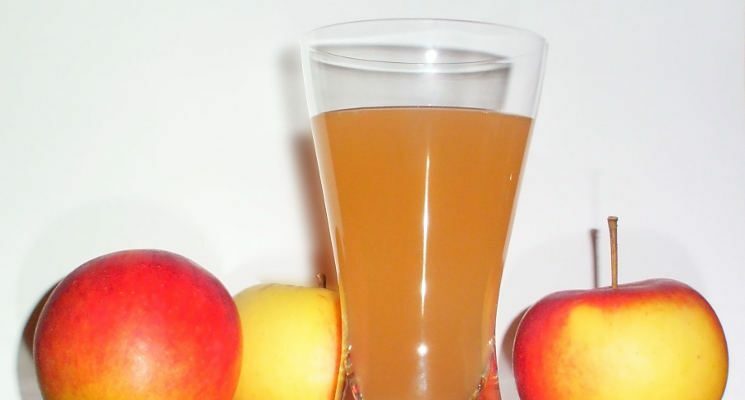 The primary acid present in apple juice is malic acid which is less bitter than citric acid in orange juice. According to the Journal of Food Composition and Analysis, even though apple juice contains six acids, very few are present in significant amounts. Malic acid is present in apple juice in larger quantities compared to other acids and is the one with most benefits. Noticeable amounts of quinic acid and chlorogenic acid are also present along with a small amount of citric acid. According to Association of Official Analytical cidicChemists, apple juice consists of sugars, nonvolatile acids, and phenolics. The sugars include glucose, fructose, sucrose, and sorbitol. The acids comprise malic, quinic, citric, shikimic, and fumaric. The phenolics include chlorogenic acid and hydroxymethylfurfural [HMF]. An article in Phytotherapy Research states that quinic acid also increases the levels of nicotinamide and tryptophan in healthy individuals. Tryptophan gets converted into serotonin, which helps regulate sleep cycles and moods as it has a soothing effect on brain. Nicotinamide helps the body to make enzymes to metabolize fats, carbs, and protein. Chlorogenic acid is an antioxidant which is naturally produced by plants. According to a study in Food and Chemical Toxicology, chlorogenic acid when given to mice showed a reduction in their weight and also reduced the triglycerides. The acid also reduces blood sugar spikes and reduces the risk of diabetes. Malic acid is present in a number of fruits including apples. This acid is generally considered safe but can also have few side effects. It may cause gastrointestinal problems such as bloating or cramping. To prevent it you should consume enough liquids throughout the day to stay hydrated. Dental erosion can damage the structure of your teeth. Pain or sensitivity to hot, cold, or sweets is an indication of erosion. The acidic level, type of acid, and exposure time in the mouth determine the erosive intensity of the juice. Consuming apple juice or any fruit juice may also cause dental erosion. Apple juice has a low pH. It softens the teeth enamel until the saliva balances the acid-base levels in the mouth. According to the Academy of General Dentistry consuming acidic beverages often prevents the mouth from maintaining natural acidity levels. Consuming apple juice on a regular basis increases dental erosion. Drinking apple juice with a straw will lessen the exposure and prevent erosion. You can also chew a sugar-free gum to stimulate the flow of saliva and neutralize the acids. You can use an anti-bacterial mouthwash after drinking the juice or prevent brushing teeth for 30 minutes to avoid erosion. Is apple juice good for acid reflux? No, in fact consuming acidic juices like apple juice may worsen acid reflux. Acid reflux is also known as gastroesophageal reflux (GERD) where the stomach acid leaks back into the esophagus. Few symptoms of reflux include hoarseness, belching, coughing, nausea, sore throat, and regurgitation. According to the Journal of Nutritional Medicine, malic acid reduces muscle pain and muscle soreness in people suffering from fibromyalgia or chronic fatigue syndrome. When used with magnesium it helps reduce pain caused by fibromyalgia. It also relieves the exhaustion caused by chronic fatigue syndrome. Malic acid is an essential element for synthesizing energy. It has shown to increase energy in patients suffering from fibromyalgia and chronic fatigue syndrome. According to a study published in Journal of Rheumatology, malic acid helps the body make ATP more efficiently. ATP is used in making energy. Malic acid also increases tolerance to exercises in people suffering from fibromyalgia. According to a study in Journal of Endourology, malic acid helps treat calcium kidney stones. So is apple juice acidic? Yes, it is. But considering the number of benefits and taking some preventive measures, you can reap maximum benefits of apple juice by including it in at least your weekly diet. Is Pineapple Acidic and Can It Cause Acid Reflux? What Makes Apple Juice Good for Constipation Relief?